Solicitors letter from Professor Casey and my right to freedom of speech! We are instructed by Professor Patricia Casey of the Mater Hospital in Dublin. Our client has instructed us in relation to comments appearing on your internet blog in which you repeat a statement that another lady made to you that “Patricia Casey ruined my son’s life”. You also publish a letter on your blog to the Irish Medicines Board on 16th March 2011. As part of this letter you say “… as Patricia Casey has a long and I am sure lucrative association with Lundbeck … you can take from that anything you want to”. The implication in this second comment is that our client either knows or ought to know of what you describe in your blog as the potentially fatal side effects of certain antidepressants, and yet continues to prescribe these anti-depressants. The very clear implication here is that our client receives payments from drug companies and is quite happy to prescribe anti-depressants to individuals who should not take these drugs and who would be placed in danger if they did take these drugs. This portrays our client as a person who is unfit to practice in the area of psychiatry. The first comment – that our client ‘ruined’ someone’s life is even more serious and while it is entirely untrue and without foundation, it is clearly extremely damaging to our client. Our client has strongly held views in this area. However, this does not entitle you to portray her as a person who knowingly and recklessly would prescribe drugs in completely inappropriate circumstances. She has commented in public on numerous occasions stating that there are many circumstances where she would never prescribe antidepressant drugs and completely accepts that there can be very serious side effects in certain circumstances. Our client has a well established reputation throughout Ireland and abroad and is a highly respected member of the psychiatric community both nationally and internationally. She is enormously sympathetic to the tragedy you have suffered since the death of your son and she has only asked us to write to you extremely reluctantly and very much as a last resort. She is not suggesting that you should remove your blog but she does insist that you immediately remove the defamatory comments about her. She has not ruined anybody’s life through the inappropriate prescription of drugs and it is very wrong of you to imply that she would seek financial gain and risk prescribing drugs to individuals who she knows would suffer as a result. The purpose of this letter is to insist that you remove the offending comments from your blog and that you do not repeat these comments or similar comments in the future. While our client feels enormous sympathy for you and your family, she cannot have her reputation destroyed or attacked in this manner and we must insist therefore that you take this appropriate action immediately so as to avoid any further difficulties in the future. communication is strictly prohibited. If you have received this communication in error, please notify us immediately by replying to message and deleting it from your computer. 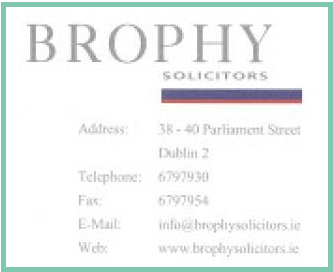 I have received this letter via e-mail from Brophy solicitors and would like to state publicly that I have never lied on this blog and my opinions are exactly that, my opinion, and in stating the facts people will come to their own conclusion but I have duly removed the offending comments. Regarding my letter to the Irish Medicines Board on 16th March 2011, I am entitled to my opinion and as I’m sure Professor Casey does not do all her work for Lundbeck for free, well that means she gets paid honoraria, otherwise known as cash, does it not? I have decided to take the other offending comment down regarding my conversation with the aforementioned lady as I would never reveal her identity, and what is said to me is, and will always, remain private and confidential (unless the person chooses otherwise). I am not the first person to write about Patricia Casey and some of my concerns have been written about before. It is not in my nature to target a particular individual (particularly one who is married to a barrister…), as I would generally feel a bit sorry for them but in this case the fact that Professor Casey attended Shane’s inquest and publicly took issue with certain aspects of it, and the fact that she is associated with psychiatry Ireland and also Lundbeck (makers of citalopram)… why would I not be allowed to publicly take issue with this and voice my own concerns? I am very glad that Professor Casey is not suggesting that I remove my blog as that is very unlikely to happen in my lifetime, as I also have some very strong views in this area. The defence of truth and Honest Opinion are still defences in Ireland are they not? Also Professor Casey has publicly stated that there is no evidence that antidepressants can cause homicide and no evidence that antidepressants can cause suicide but yet Lundbeck admit it in their Canadian healthcare professional letter. Scroll up to 5 mins and 36 seconds on this youtube video http://youtu.be/vV7HhfvxHPk and the question is asked about a recent case in the Irish media, which I presume is referring to my son, so am I to take it that Professor Casey is defaming me with her denial? As for the confidentiality clause at the end of this e-mail…I did not agree to keep this letter confidential and it is my choice not to do so and I take issue with the legalese language, presumably trying to silence me! P.S. If anyone at Brophy solicitors or indeed Professor Casey would like to reply, please feel free to leave a comment. Previous postDoubts cast over Pat O’Mahony, conflict of interest and the Irish Medicines Board. Next postCitalopram (cipramil/celexa) Escitalopram (Lexapro/Cipralex); Same product? My heart goes out to Leonie . During my research into the dark world of Psychiatry I have found and continue to find individuals that are brave enough to speak their mind and Psychiatrists unwilling to listen. There are many reasons why they [Psychiatrists] prescribe drugs from, ‘we can’t have patients suffering’, to, ‘the risk out weighs a patients [current] suffering’. It’s a sad comment on the worldwide thought process of mainstream Psychiatry that Psychiatrists who are steeped in honors and accolades from their peers are unwilling (from personal beliefs or associations with pharmaceutical companies), to follow the oath to, “DO NO HARM”. Here here, well put Leonie. Congratulations Leonie. As a champion of informed consent you are obviously making a huge impact. Professor Casey must consider that a large number of potential clients read your blog and will be persuaded to research SSRIs carefully before accepting a prescription. One would think a psychiatrist would support fully informed consent, be happy to have patients taking responsibility for their health and asking well informed questions. I imagine where it is impossible to provide evidence of any benefits of the treatment which have been shown through repeated meta-analyses to have no or negligible benefits above placebo this puts her in a very difficult position. Clearly her practice relies on people not having access to information which may cause them to question the use of SSRIs given she is unable to present evidence of their benefits or to deny evidence of their risks. Those confident that these drugs are safe and effective would have no need to shut down others who question their use. They would counter any arguments against the drugs with evidence that their benefits outweigh those risks or that the risks do not exist. It seems clear Dr Casey is resorting to attempting to bully you simply because she cannot counter your arguments. This speaks volumes about the current state of psychiatric medicine. It is telling that rather than engage in open debate on the issue of SSRI prescribing which has the potential to increase public understanding of SSRIs she choses to focus on protecting her reputation by undermining yours. It may well be her honestly held opinion that her actions do not place people at risk. She is entitled to this opinion. What she is not entitled to do is to bully those who hold opposing opinions. The subtext of her comments and actions is that you are untruthful and a ‘poor addled grieving mother, who should be pitied rather than respected.’ This is an attack on your reputation and credibility, something she claims to abhor. I wonder if Dr Casey would be prepared to swear an affidavit stating she has never received any form of payment or gratuity from Lundbeck? I wonder if she would be prepared to swear an affidavit stating that none of her patients have ever had their functioning and enjoyment of life undermined by adverse effects from the drugs? In my view, Dr Casey undermines her own reputation by taking this action. Certainly I would find it difficult to respect someone who writes such a letter to an advocate for informed consent. The respect I have for your opinion and work however is increased when I see the evidence of the impact you are having! You my friend are clearly rattling her ! Scandalous that it is OK to defame you and Shane’s memory with her constant delusional denials..
Respected….this world most certainly has gone mad..
Was she not a member of the pro-pharma pack that attacked and helped destroy the career and name of Prof Corry? Now there is a man WORTHY OF RESPECT. Not sure…I wasn’t here long then? She gets far too much publicity and the balance needs to be restored! Casey…………do NOT underestimate the courage, will, fury and love of a mother.. The most powerful force you’ll ever encounter! I challenge you to prove beyond a shadow of a doubt that you have NOT ruined anyone’s life by prescribing anti-depressants as your solicitor so boldly claims? Shall we dig, advertise and ask around for more examples apart from the furious person mentioned? Imagine the damage to your perfect reputation that would do. He was a fantastic, honourable man and one I will remember forever. He made sure I will always remember when he died as he died on 22 february, also Shane’s birthday. I don’t know what myself and Tony would have done without him but sadly there are precious few good medical professionals left who are willing to speak out. Thank goodness for Professor David Healy. P.S. 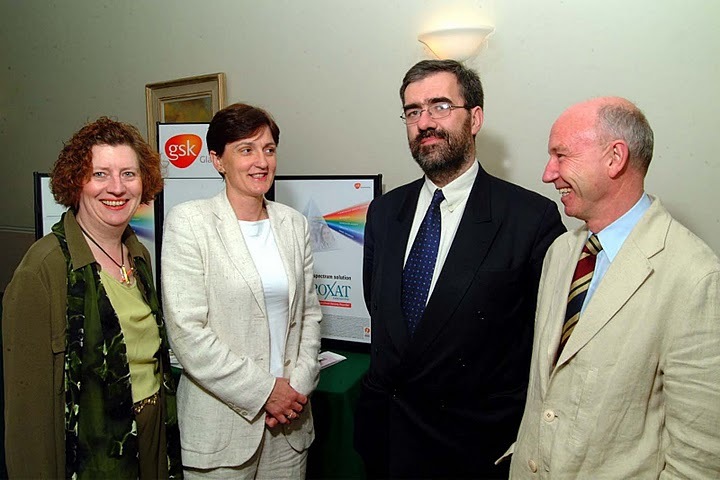 Actually I forgot about Dr. Orla O’Donovan in UCC Cork and Pat Bracken also from Cork. The media darling, Patricia Casey says I would also push to get psychiatry recognised as a valid specialty. That is the most telling statement in this article. The reason psychiatry has never been valid is because it is based on theories and junk science. For shane. It’s taken me most of the afternoon to write about this, going though wads of Kleenex. I don’t know what else to say other than I am beyond upset that this happened to you, that these asshats are making your life miserable. You got some of the best bloggers on the blogosphere on this- Stephany, Truthman and Bunker, as well as Fiddy. You and your son won’t be forgotten. We’ll stay on this until you get the justice you seek. More bloggers picking this story up.. I just watched the video of Prof. Casey defending her drugs…. I just can’t believe how these so called “professionals” have the guts to spread completely unfounded myths and present the as scientific. She says that antidepressants can cause manic (which she equates with psychotic???) episodes in certain individuals predisposed to bipolar disorder. Hang on a second: Since when do we have a measurable marker that can determine who is predisposed to bipolar disorder? How can they know that an individual who got manic or psychotic on an antidepressants was “predisposed”? That’s just silly. Blaming the patient for a side effect clearly induced by the drug…..? What a sad profession that needs this kind of methods. Shame on them. It seems like the whole profession of psychiatry is solely based on such pseudo-scientific claims. I honestly don’t know how those people can look at themselves in the mirror every day.